"Computer imagery" redirects here. For (backup) copies of the entire state of a computer system, see System image. 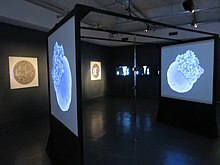 Morphogenetic Creations computer-generated digital art exhibition by Andy Lomas at Watermans Arts Centre, west London, in 2016. Computer-generated imagery (CGI) is the application of computer graphics to create or contribute to images in art, printed media, video games, films, television programs, shorts, commercials, videos, and simulators. 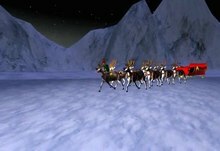 The visual scenes may be dynamic or static and may be two-dimensional (2D), though the term "CGI" is most commonly used to refer to 3D computer graphics used for creating scenes or special effects in films and television. Additionally, the use of 2D CGI is often mistakenly referred to as "traditional animation", most often in the case when dedicated animation software such as Adobe Flash or Toon Boom is not used or the CGI is hand drawn using a tablet and mouse. Not only do animated images form part of computer-generated imagery, natural looking landscapes (such as fractal landscapes) are also generated via computer algorithms. A simple way to generate fractal surfaces is to use an extension of the triangular mesh method, relying on the construction of some special case of a de Rham curve, e.g. midpoint displacement. For instance, the algorithm may start with a large triangle, then recursively zoom in by dividing it into four smaller Sierpinski triangles, then interpolate the height of each point from its nearest neighbors. The creation of a Brownian surface may be achieved not only by adding noise as new nodes are created but by adding additional noise at multiple levels of the mesh. Thus a topographical map with varying levels of height can be created using relatively straightforward fractal algorithms. Some typical, easy-to-program fractals used in CGI are the plasma fractal and the more dramatic fault fractal. A large number of specific techniques have been researched and developed to produce highly focused computer-generated effects — e.g. the use of specific models to represent the chemical weathering of stones to model erosion and produce an "aged appearance" for a given stone-based surface. A computer generated image featuring a house, made in Blender. Modern architects use services from computer graphic firms to create 3-dimensional models for both customers and builders. These computer generated models can be more accurate than traditional drawings. Architectural animation (which provides animated movies of buildings, rather than interactive images) can also be used to see the possible relationship a building will have in relation to the environment and its surrounding buildings. The rendering of architectural spaces without the use of paper and pencil tools is now a widely accepted practice with a number of computer-assisted architectural design systems. Architectural modeling tools allow an architect to visualize a space and perform "walk-throughs" in an interactive manner, thus providing "interactive environments" both at the urban and building levels. Specific applications in architecture not only include the specification of building structures (such as walls and windows) and walk-throughs but the effects of light and how sunlight will affect a specific design at different times of the day. Architectural modeling tools have now become increasingly internet-based. However, the quality of internet-based systems still lags behind that of sophisticated in-house modeling systems. In some applications, computer-generated images are used to "reverse engineer" historical buildings. For instance, a computer-generated reconstruction of the monastery at Georgenthal in Germany was derived from the ruins of the monastery, yet provides the viewer with a "look and feel" of what the building would have looked like in its day. A CT pulmonary angiogram image generated by a computer from a collection of x-rays. Computer generated models used in skeletal animation are not always anatomically correct. However, organizations such as the Scientific Computing and Imaging Institute have developed anatomically correct computer-based models. Computer generated anatomical models can be used both for instructional and operational purposes. To date, a large body of artist produced medical images continue to be used by medical students, such as images by Frank H. Netter, e.g. Cardiac images. However, a number of online anatomical models are becoming available. A single patient X-ray is not a computer generated image, even if digitized. However, in applications which involve CT scans a three-dimensional model is automatically produced from a large number of single slice x-rays, producing "computer generated image". Applications involving magnetic resonance imaging also bring together a number of "snapshots" (in this case via magnetic pulses) to produce a composite, internal image. In modern medical applications, patient-specific models are constructed in 'computer assisted surgery'. For instance, in total knee replacement, the construction of a detailed patient-specific model can be used to carefully plan the surgery. These three-dimensional models are usually extracted from multiple CT scans of the appropriate parts of the patient's own anatomy. Such models can also be used for planning aortic valve implantations, one of the common procedures for treating heart disease. Given that the shape, diameter, and position of the coronary openings can vary greatly from patient to patient, the extraction (from CT scans) of a model that closely resembles a patient's valve anatomy can be highly beneficial in planning the procedure. 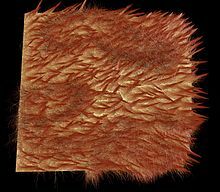 The geometric macroscopic features of cloth. To date, making the clothing of a digital character automatically fold in a natural way remains a challenge for many animators. In addition to their use in film, advertising and other modes of public display, computer generated images of clothing are now routinely used by top fashion design firms. Function realism in resembling its response to actions. The finest visible features such as fine wrinkles and skin pores are the size of about 100 µm or 0.1 millimetres. Skin can be modeled as a 7-dimensional bidirectional texture function (BTF) or a collection of bidirectional scattering distribution function (BSDF) over the target's surfaces. Interactive visualization is the rendering of data that may vary dynamically and allowing a user to view the data from multiple perspectives. The applications areas may vary significantly, ranging from the visualization of the flow patterns in fluid dynamics to specific computer aided design applications. The data rendered may correspond to specific visual scenes that change as the user interacts with the system — e.g. simulators, such as flight simulators, make extensive use of CGI techniques for representing the world. At the abstract level, an interactive visualization process involves a "data pipeline" in which the raw data is managed and filtered to a form that makes it suitable for rendering. This is often called the "visualization data". The visualization data is then mapped to a "visualization representation" that can be fed to a rendering system. This is usually called a "renderable representation". This representation is then rendered as a displayable image. As the user interacts with the system (e.g. by using joystick controls to change their position within the virtual world) the raw data is fed through the pipeline to create a new rendered image, often making real-time computational efficiency a key consideration in such applications. While computer generated images of landscapes may be static, the term computer animation only applies to dynamic images that resemble a movie. However, in general, the term computer animation refers to dynamic images that do not allow user interaction, and the term virtual world is used for the interactive animated environments. Computer animation is essentially a digital successor to the art of stop motion animation of 3D models and frame-by-frame animation of 2D illustrations. Computer generated animations are more controllable than other more physically based processes, such as constructing miniatures for effects shots or hiring extras for crowd scenes, and because it allows the creation of images that would not be feasible using any other technology. It can also allow a single graphic artist to produce such content without the use of actors, expensive set pieces, or props. To create the illusion of movement, an image is displayed on the computer screen and repeatedly replaced by a new image which is similar to the previous image, but advanced slightly in the time domain (usually at a rate of 24 or 30 frames/second). This technique is identical to how the illusion of movement is achieved with television and motion pictures. A virtual world is a simulated environment, which allows the user to interact with animated characters, or interact with other users through the use of animated characters known as avatars. Virtual worlds are intended for its users to inhabit and interact, and the term today has become largely synonymous with interactive 3D virtual environments, where the users take the form of avatars visible to others graphically. These avatars are usually depicted as textual, two-dimensional, or three-dimensional graphical representations, although other forms are possible (auditory and touch sensations for example). Some, but not all, virtual worlds allow for multiple users. Computer-generated imagery has been used in courtrooms, primarily since the early 2000s. However, some experts have argued that it is prejudicial. They are used to help judges or the jury to better visualize the sequence of events, evidence or hypothesis. However, a 1997 study showed that people are poor intuitive physicists and easily influenced by computer generated images. Thus it is important that jurors and other legal decision-makers be made aware that such exhibits are merely a representation of one potential sequence of events. Photoshop is the industry standard commercial digital photo editing tool. Its FOSS counterpart is GIMP. ^ a b c Peitgen 2004, pp. 462–466. ^ Sondermann 2008, pp. 8–15. ^ Biocca & Levy 1995, pp. 40–44. ^ Begault 1994, p. 212. Begault, Durand R. (1994). 3-D Sound for Virtual Reality and Multimedia. AP Professional. ISBN 978-0-1208-4735-8. Biocca, Frank; Levy, Mark R. (1995). Communication in the Age of Virtual Reality. Lawrence Erlbaum Associates. ISBN 978-0-8058-1549-8. Peitgen, Heinz-Otto; Jürgens, Hartmut; Saupe, Dietmar (2004). Chaos and Fractals: New Frontiers of Science. Springer Science & Business Media. ISBN 978-0-387-20229-7. Sondermann, Horst (2008). Light Shadow Space: Architectural Rendering with Cinema 4D. Vienna: Springer. ISBN 978-3-211-48761-7. A Critical History of Computer Graphics and Animation – a course page at Ohio State University that includes all the course materials and extensive supplementary materials (videos, articles, links). CG101: A Computer Graphics Industry Reference ISBN 073570046X Unique and personal histories of early computer graphics production, plus a comprehensive foundation of the industry for all reading levels. F/X Gods, by Anne Thompson, Wired, February 2005. This page is based on the Wikipedia article Computer-generated imagery; it is used under the Creative Commons Attribution-ShareAlike 3.0 Unported License (CC-BY-SA). You may redistribute it, verbatim or modified, providing that you comply with the terms of the CC-BY-SA.